The EDP awards are a judged by an expert Technical Committee from more than 21 trade publications covering 27 countries that reach more than 500,000 readers. The panel investigates the features and qualities of products and grants awards for the best products of the year. The EDP awards have become the “most prestigious and valuable technical award for the digital production business in Europe,” said Klaus-Peter Nicolay, President of the EDP Association. 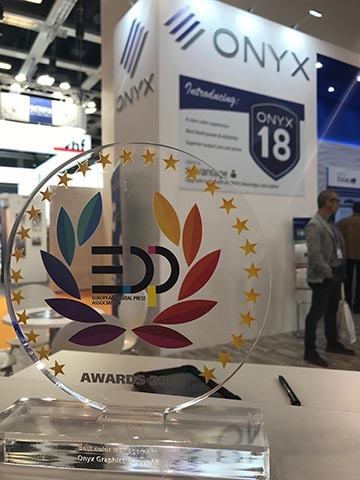 Onyx 18 emerged as a clear EDP award winner this year, which saw more than 120 entries in its twelfth year of granting these prestigious awards to industry leaders. Onyx software was also recognized as 2018 finalist for best Workflow Technology, Workflow Solutions as well as best MIS solution. Onyx Color, the industry-leading color engine, includes core enhancements for improved black ink combinations that give increased shadow detail, texture and definition, as well as increased saturation of reds and oranges without compromising ink savings. Textile and soft signage application benefit especially from these enhancements. ColorCheck is a new approach to process control that enables print service providers to guarantee color accuracy to their customers as well as ensure consistency of output across devices over time. ColorCheck ensures conformance to standards including G7 and Fogra as well as baseline testing for process control and in-product indicators for printer recalibration. PosterColor 2.0, a technology first introduced to the industry by Onyx Graphics, uses next-generation smart rendering intent to boost saturation of solid colors for added ‘pop’ across all image types.